Here we have a fabulous collection of vintage Madonna and Child Images! The images are from cards, postcards, and even photo postcards. This curated set of antique Madonna and Child pictures begins with six beautiful antique postcards. Then we have a beautiful piece of Victorian scrap and a lovely Christmas card. The last image is a gorgeous photo postcard featuring a lovely woman holding a child portraying Mary and the Baby Jesus. I thought these images might be nice to use on a Church Program or for your Christmas craft projects! Most would make a lovely Christmas greeting card. 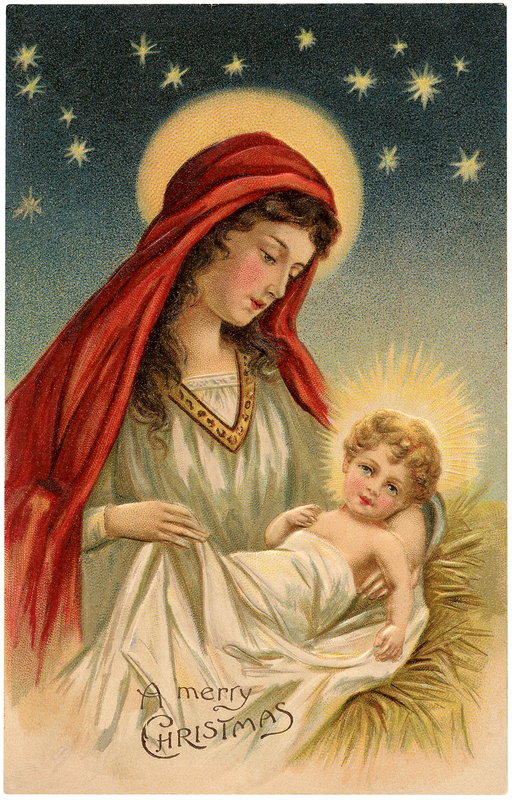 This is a lovely Old World Christmas Image featuring the Baby Jesus and Mary! There’s a beautiful branch of holly framing the picture. The greeting says, “Christmas bring you Joy and Peace.” I am not sure if it is a typo, but the type itself is just beautiful. This one is so gorgeous!!! 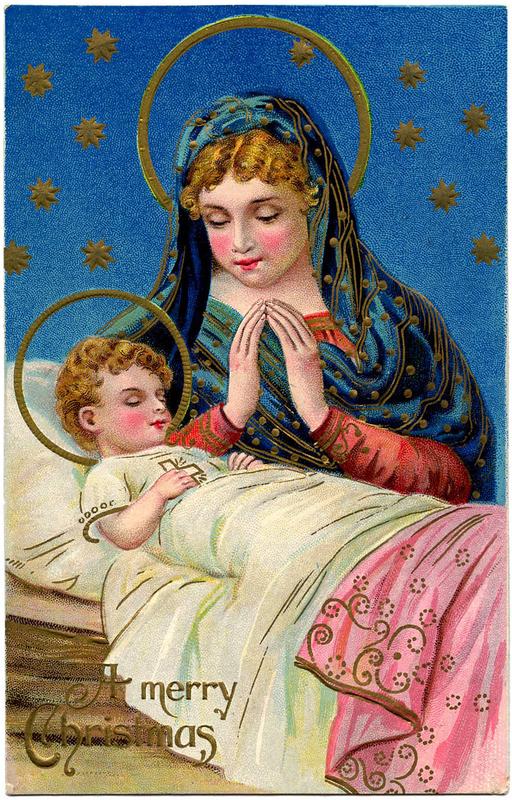 It is a beautiful antique Christmas postcard showing a sleeping Baby Jesus with the Madonna praying by his side! The background setting is a Starry Blue Night. 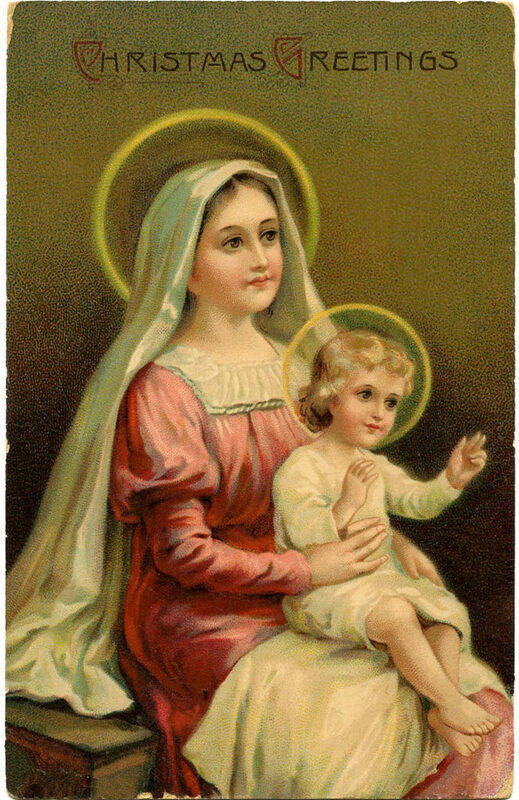 This is a lovely antique postcard features a beautiful vintage Madonna and Child picture. Such sweet faces! The infant is sitting on his Mother’s lap. Both have beautiful halos. Another exquisite postcard depicting the baby Jesus and Mary. This vintage Madonna and child picture is from France. They are sitting under and arched opening with gold ornamental fretwork. The Madonna has on a flowing burgundy gown, her hands gently caressing the baby Jesus. You might like a beautiful Christmas Project using this image, you can find the tutorial HERE. 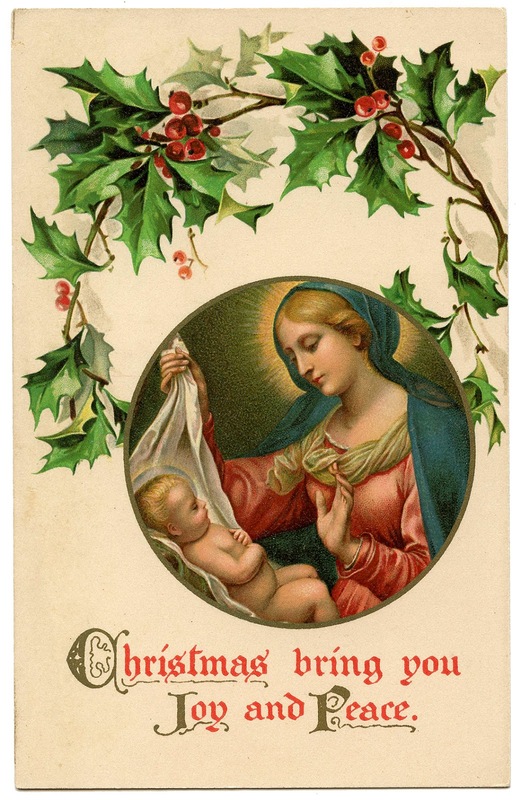 The beautiful Vintage Madonna with Child Image shown above is a fabulous old Postcard featuring Mary with the Baby Jesus. So lovely the way her scarf and gown flow.! I love the Mistletoe and Holly Border on this one too! 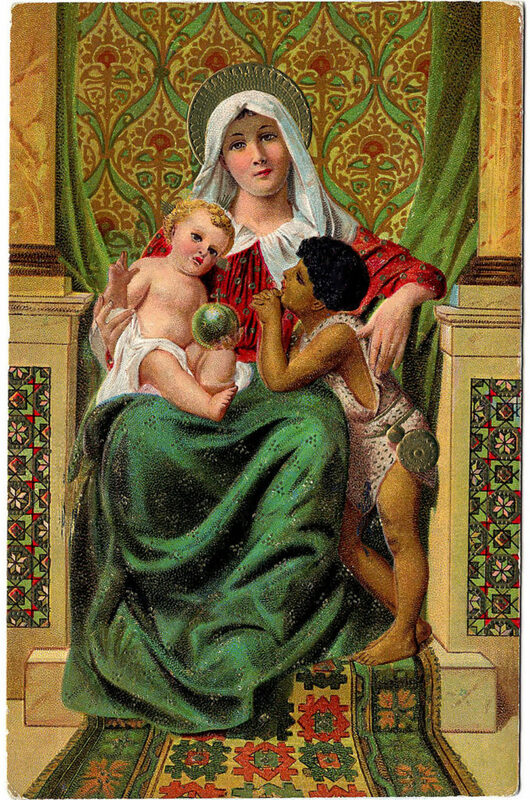 We have another Antique Postcard (Circa 1910), showing a Beautiful Madonna holding the Baby Jesus as well as another child. The colors are so gorgeous in this one, Red, Green, and Gold. The intricate designs and patterns of the wallpaper and carpet are stunning. A simply beautiful Madonna with Child Image is a lovely Victorian Scrap piece. I think this is such a special piece. Their faces are so gentle with large, soft eyes. I particularly love the hands in this image. 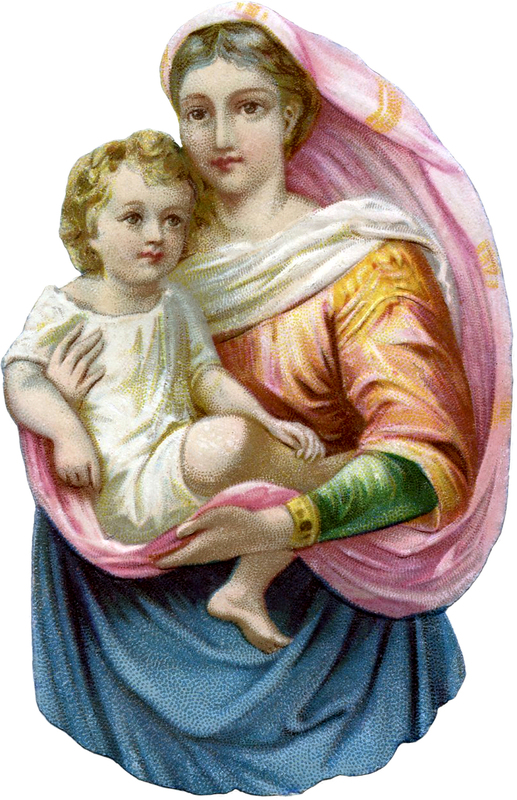 Our final Madonna and Child picture is a gorgeous vintage Mary with Jesus Download! 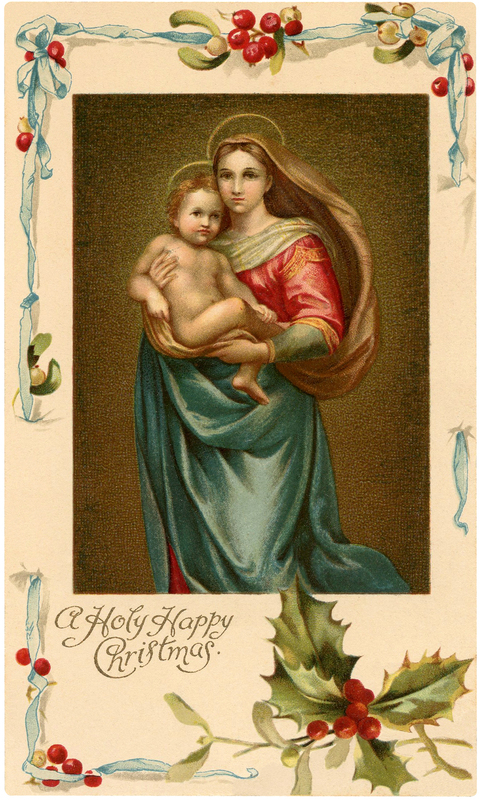 It is a wonderful Antique Card picturing the Virgin Mary holding the Baby Jesus. Stars shine overhead. 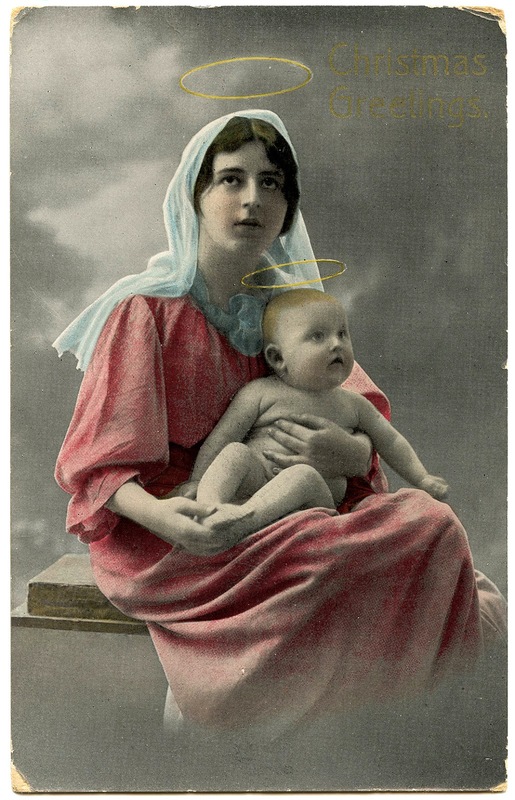 Here we have our final beautiful Old Real Photo Postcard (Circa 1914) of a young woman holding a chubby baby representing Mary and Jesus. I just love their Golden Halos! I hope you enjoyed this curated collection of vintage Madonna and Child images. You might also like our Vintage Christmas Nativity Images Here! 8 Christmas Church Images! 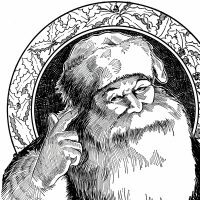 6 Santa Illustrations – Black and White 12+ Best Snowman Images! « 6 Angels with Christmas Trees Clipart! I love this depiction of Mary and Jesus. The surrounding elements are very pretty too. 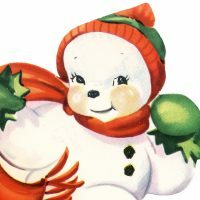 Thank you, and Merry Christmas to you! Thank you Peggy! Merry Christmas to you too! Thank you so much for these Amazing Madonna and Child pictures!!! Thank you these beautiful images! You are so welcome Bev!